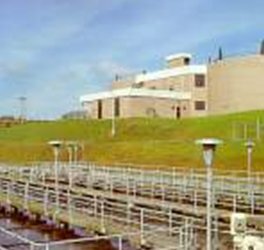 Following preliminary treatment, wastewater enters three primary settling tanks which reduces flow velocity and provides a condition for the settling of solids that are denser than water. The solids that settle during this 3 to 4 hour detention time are collected as primary (or raw) sludge and are pumped to degritting equipment in the Thickener Building. The separated grit is sent to the landfill and the degritted sludge is pumped to the solids holding tank. In the solids holding tank, other sludges are intermixed. This mixture is pumped to the gravity belt thickener and the resulting thickened sludge is pumped to the anaerobic digester. 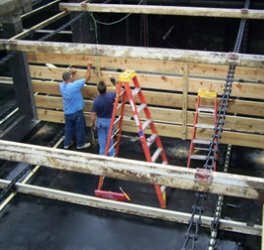 Solids that remain in suspension or are dissolved in the wastewater then flow via gravity to further treatment processes.